This is my first time playing along with the Mojo Monday sketch and actually submitting my entry before the deadline! I wasn't sure what I was going to create with this sketch at first. I've got quite a bit of Verve stamps I haven't used yet and received my latest order this week. So, more Verve to add to the mix and they are all just wonderful so how do you choose? Then I remembered that my brother has a birthday at the end of the week and certainly he deserves a handmade card. I started my card with some retired SU DSP - Le'Jardin. I used just one sheet from the collection, taking advantage of the fact that it is double sided. I used River Rock and Sky Blue cardstock for mounting the layers. Instead of doing a scalloped border like you see in the sketch I chose to use the fleur de lis border stamp from "Kindred Spirits" and stamp a border using Aegean Blue ink from VersaMagic. I cut out two scalloped ovals using the Storybook cartridge and my Cricut Expression - one in white and one in Sky Blue. On the white oval I used the balloon image from "Black Tie Birdies" and stamped a bouquet of ballons and colored them ever so lightly with my copics. My "enjoy today" sentiment comes from the same set. I added some Sky Blue ribbon and some buttons from my stash to complete my card. I never feel like a project is complete without inking the edges so all the edges are inked with either Sky Blue or River Rock Classic Ink from SU. Well, I hope you like the card I shared with you today and if you haven't ever tried Verve stamps you should! They are simply the best clear stamps I have ever used, hands down. And no, I do not work for the company nor am I a member of their design team. Just a truly pleased customer with the products they offer and the kindness I have experienced from the Verve Co. Owner, Julee Tilman and her wonderful Verve Divas! wow Jennipher a totally amazing card, love the colours and your brother will love it I am sure. Beautiful card. I'm sure your brother will love it. What an awesome creation Jennipher & you totally ROCKED that sketch Hun! Excellent work & TFS!!!!! Just darling! Love your fleur de lis border and your fun bouquet of balloons. Thanks for playing along with Mojo Monday! Oh its a beautiful card!!! Very pretty! Love your wonderful balloons. Very cute! I love the papers, colors, and most of all the wonderful balloons. 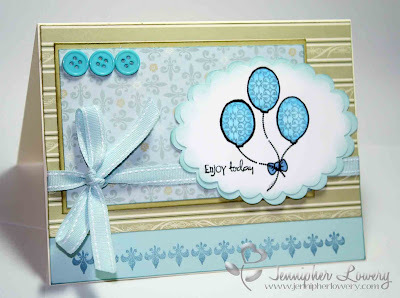 So pretty Jennipher, I really like the blue distress around the edging of the cloud and the balloons are to cute! I hope you're doing well, hugs. Love the soft colors and your take on the sketch! Your brother is going to love it! It was my first time submitting to Mojo MOndays on time for the challenge too!!!!! That is tii funny - you did a great job on it also!